This is a very cool INCREDIBLE HULK original movie prop set that was used by Marvel Studios and. 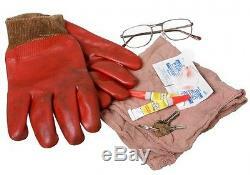 It features glasses, work gloves, superglue tube (to help seal the cut on his hand), some faux blood cloth, hand towel, wipes, and some keys to Banners apartment. 100% authentic from the studio!!! Don't miss out on this original movie prop used by Marvel Studios in the making of the Hulk movie. The display is in excellent condition and it comes with a COA from Marvel and Propworx. Don't miss out on this WONDERFUL prop for your collection. The item "INCREDIBLE HULK Bruce Banner Original Movie Prop Set Glasses/Gloves AVENGERS" is in sale since Thursday, April 26, 2012.